I turned what I laughingly call “professional” as a photographer about 4 years ago in early 2015, having left the IT sector (marketing/PR). My last employer had gained great advantage from my enthusiasm for photography and I ended up being the photographer-in-residence, doing event reportage and corporate mugshots – very convenient as my employer didn’t have to pay extra money to engage a proper photographer. I was fortunate enough to have had the chance to work with real professional photographers at some company events and I am particularly indebted to Rob Matthews, who did some work with our PR team and enabled me to learn a huge amount about corporate photography simply by watching him in action. Oh, and badgering him with endless, probably stupid, questions. Having left full-time employment, my goal was to carry on doing corporate photography, and my first gig was February 2015. It was also my first attempt at videography, which was not ultimately successful but which taught me a huge amount, mainly about how much I still had to learn about video. My main gear at the time was a pair of Nikon D300s, which were really good for stills but had serious shortcomings for video work. So, I invested in a Nikon D5300 which would enable better video capabilities whilst still allowing me to make use of the lenses I had. Looking through this list it becomes clear that my requirements were evolving. The Panasonic was partly for personal use, to save me perpetually having to lug a full-sized DSLR around when I thought I might need a camera to hand, but also has reasonable quality from a larger-than-standard-compact sensor (1″ for those who care about these things) and was also capable of recording video. The D500 was because I realised that full-frame was not the be-all-and-end-all I had expected; there are occasions when the extra reach of a crop-sensor camera is an advantage, particularly in corporate event photography, for capturing speakers on stage at a distance. The autofocus coverage is better on the D500, something I felt I particularly needed. And, like the Panasonic, the D500 can do video. The last two entries on the list are for video cameras which can take stills, rather than the other way round. It was becoming clear that having video capabilities was becoming more and more important. And I was finding that the big Nikons, which are wonderful for still photography, have their shortcomings when used for video – particularly autofocus and image stabilisation. So my thoughts had turned towards moving (shock! horror!!) away from Nikon in order to get cameras that would handle video better. The main contenders were from Panasonic (G or GH) models and Fuji (XT series). The key difference between these cameras and my beloved big Nikons was – the mirror. All DSLRs have a mirror whose normal position is down so you can frame the picture through the viewfinder; it then flips up so that the image can be exposed onto the sensor. I loved the feel of all of this complicated mechanical stuff every time I pressed the shutter of the D500. It just felt….right. But the mirror has to stay up for video work, and the focusing mechanism is therefore perforce changed to a much slower, inferior method. One is effectively condemned to using manual focus, since autofocus brings so many unwelcome effects into play. Changing camera manufacturers would be a Very Big Deal for me. It’s not the cameras, it’s the lenses. I have six Nikon lenses, half of which are pro spec, beautiful to use and very expensive. If I were to change to another manufacturer, I would have to completely reinvest in lenses, and I quailed at that prospect. So I put off the decision and put it off and Made Do with what I had and its shortcomings for video work awaiting the time when I screwed up the courage (and the funds) to make the big leap. However, I’m glad to say that Nikon saved the day! THey an announcement that shook the industry – two brand-new mirrorless cameras, the Z7 and Z6. The photographic press went berserk, of course, and it quickly became apparent that these cameras were held in high regard by almost all the photography journalists who reviewed them. My particular go-to sites are dpreview and Amateur Photographer (you can take the photographer out of the amateur, but you can’t take the amateur out of the photographer). 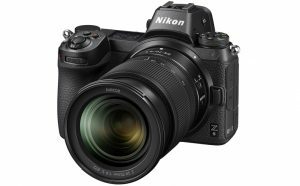 MIchael Topham’s glowing review of the Z6 was the tipping point, and in late November 2018 I put my order in with the idea of replacing my D750. I have just (late January 2019) received the camera, along with the adapter that enables me to use all my lovely Nikon glassware with it, and initial impressions are that it will do in still photography anything that my D750 will do and will also do a vastly superior job at video. One Response to "Going Mirrorless"